I HAVE always enjoyed telling stories. That's why I became a journalist. But, as it turned out, I spent most of my time editing the stories of others. To make up for this, I enjoyed writing fiction in my spare time as a hobby. In fact, over the years, I have written several novels. However, it was not until I took early retirement a couple of years ago that I had time to polish up these and do my best to get them published. One result was Where Angels Tread, which I am launching at a book signing on Wednesday May 9 from 7pm. 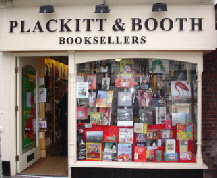 This is at my favourite bookshop, Plackitt & Booth, in Lytham (pictured), here on the Fylde coast of Lancashire. By coincidence, May 9 is also the 12th birthday of my niece Bryony in New Zealand. Bryony also enjoys telling stories and has already penned her first epic in an exercise book and is busy writing more. I hope we both have a great time on May 9. Where Angels Tread is one of my most original books and was inspired by an obituary. It was the obituary of the chief obituary writer of the Los Angeles Times. I had no idea until reading this what big business obituary writing was, particularly in the United States, or how fascinating it can be. This inspired me to write a story about a fictional obituary magazine which, in contrast to 'Hello!' magazine, I called 'Goodbye'. You can hear a reading from it on May 9 or, like my other titles, order it through my Books page. The store also sells my other published books and I hope to read briefly from Saddle Up! 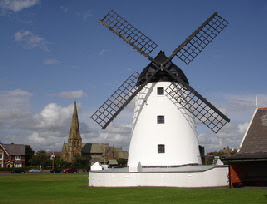 This started as a series of character portraits on this website and is an affectionate salute, rather than a proper history, to Blackpool's oldest inn. I was also lucky enough to work for three years in Hong Kong and The Last Ghosts is a thriller set there in the 1990s. Despite its title, it does not involve ghosts. In Cantonese, westerners are known as "gwailos" which means 'foreign devil' or, literally, 'white ghost'. The last but not least book I will read from is Life of Bliss. This is a fictional life story and novel which I thought would be more fun than a conventional memoir. The reading touches on my time in Australia and the furthest from home I travelled - to Cooktown, northern Queensland. That, of course, is not as far as New Zealand. I shall be thinking of Bryony at her party in Palmerston North, then raising a glass to her at mine, when she'll be tucked up in bed and dreaming up new stories. We also have a new Serial Story, called Advantage Love, about romance at a village tennis club. There is also some real-life memoir on the People & Places page.